As a kid, I loved Haagen-Dazs popsicles that combined creamy vanilla ice-cream with what tasted like frozen orange juice. I re-created this flavor combination into a perfect kids treat! 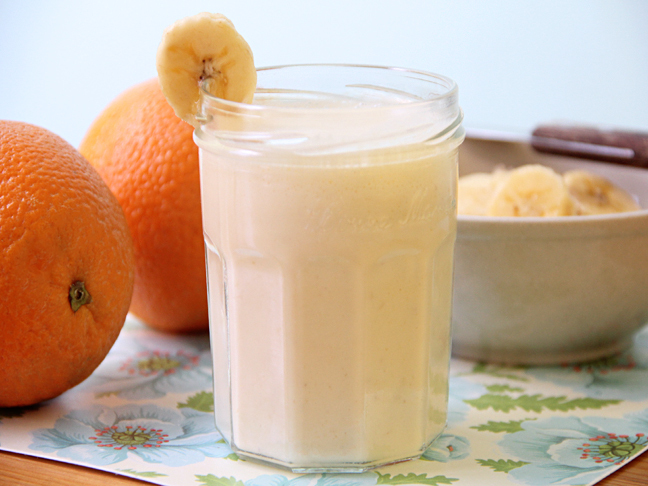 It's an eye-opening blend of orange juice, vanilla and banana and it works as a perfect on-the-go breakfast or snack. It's packed with vitamin C to boot! For a busy mom, this is fantastic because it takes just moments to make. You can also pour this smoothie into any popsicle mold (ice-cube trays are great for this too). Insert in the freezer and let it set up and then enjoy a frozen treat! And never hesitate to be creative — think about what fruits inspire you as you walk through the Farmers' Market, etc.? Does you child love strawberries, blueberries, or grapefruit? If so, you can create your own combinations by just using the measurements below and the flavors you love!